Businesses need to be up, running, and profitable. The key component to business success is keeping key person or persons active and healthy. Just Being Healthy takes wellness to a new level. 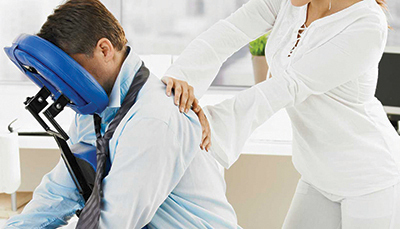 We offer business and corporate chair massage for health fairs, crunch times, and special events but we have more. We partner with other professionals to complete a wellness package unlike any other. Think of us the next time your business has had a rash of sick calls, call offs, increase injury, or of course for open enrollment. Not just for open enrollment or your annual health fair anymore. Crunch time, celebration, or increases in injury, sickness, or decreased productivity. * Travel fees may apply.